Mmmmm. Gourmet specialty pizza by the slice. Think of Dewey's Pizza or Mellow Mushroom. Then think of being able to sample a slice of everything on their menu. That's PizzaBomba. Pounding the pavement in their extreme pizza wagon, the Bomba team serves up four specialty pies daily, hot, fresh and wood-fired from their truck. Each has fluffy, buttery crust that puts other doughs to shame. Of course, the menu offers traditional cheese or pepperoni, but my taste buds like adventure. Crab Rangoon Pizza: cream cheese, plentiful chunks of crab meat, sweet chili sauce, topped with mozzarella and provolone. Oktoberfest: creamy sour kraut spread topped with sliced bratwurst and mettwurst and covered with mozzarella and provolone. Macaroni & Bier Cheese: dollops of beer cheese topped with cooked macaroni, provolone, mozzarella, and cheddar. When you visit PizzaBomba, you'll find Bill chatting with customers on the ground and Terri slinging pies in the truck. With locally sourced ingredients, pizza by the slice or by the pie, and the most explosive eye-catching logo in town, everything you find at this food truck is da'bomb! 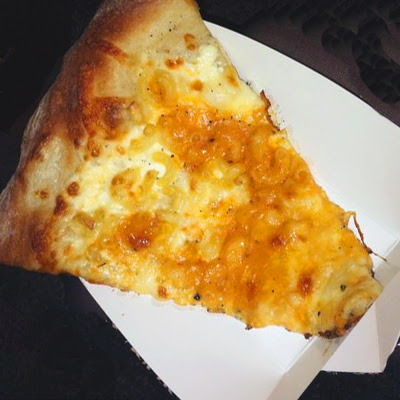 Find PizzaBomba at Fountain Square weekdays during lunch, Night Owl Market, City Flea, and weekend evenings around OTR. Follow PizzaBomba on Twitter to see when they'll roll into your neighborhood.